With ClusterControl gaining in popularity, we are seeing users coming in from different angles. 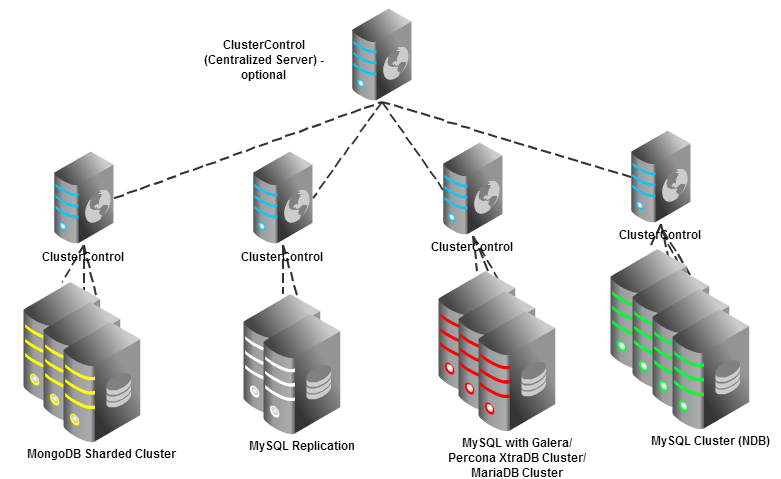 Some users are deploying their database cluster using our Online Configurators, others are looking to install ClusterControl to manage an existing database cluster. And some other users prefer to install ClusterControl first, and then use it to deploy database clusters on-premises. In this blog post, we will cover the different options. 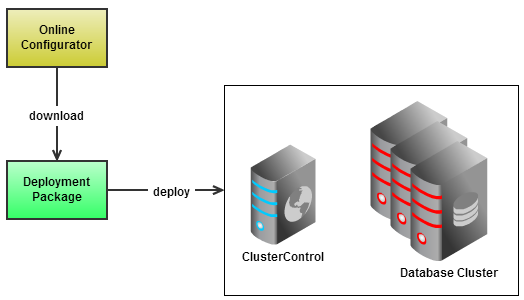 ClusterControl Server (deployed on ClusterControl host) - this is the controller that automates all the management procedures on the database cluster. ClusterControl provides a modern Web UI to visualize the cluster and schedule tasks like backup, configuration changes, upgrades, etc. ClusterControl agents (deployed on database hosts) - lightweight agents that monitor and report host and database status to the controller. All monitoring data is stored on the ClusterControl Server’s database. Note that each cluster needs a dedicated local ClusterControl host. For users with multiple database clusters, it is possible to have a dedicated host for a centralized ClusterControl server to monitor and manage your clusters. ** The number of minimum servers for each database cluster type has been illustrated in the above diagram. This is the fastest way to get started. Use the online wizard, enter some basic information about your servers (e.g. IP addresses), and generate a Deployment package. Untar it on one of your servers (the ClusterControl server) and run deploy.sh. For step by step explanations and screenshots, read this blog post. Another option is to install ClusterControl first on a central server or virtual machine, and use that to deploy your database clusters. 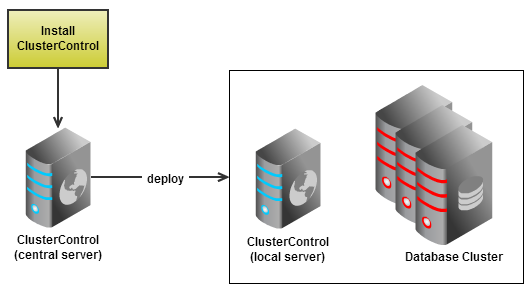 This article from our knowledge base shows you how to install the ClusterControl application to do on-premises deployments. To get ClusterControl automatically installed in your existing database cluster, you can use our s9s_bootstrap script available at http://www.severalnines.com/download/cmon. 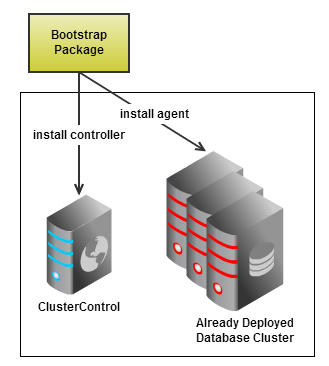 You would need to prepare a server for ClusterControl, download the bootstrap script on it and start the installation. 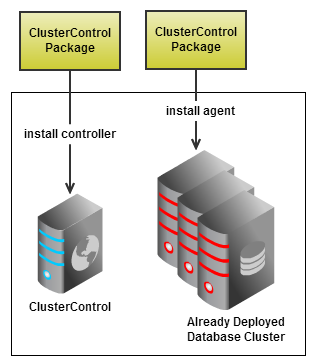 You can read this article from our knowledge base to automatically install ClusterControl on your existing database cluster. It is possible to manually install ClusterControl on your existing cluster, either using RPM packages for certain operating systems or using the pre-compiled binary package (generally for all operating systems). The packages can be downloaded from http://www.severalnines.com/downloads/cmon . Manual installation instructions are intended for advanced users or for those who are using non-supported/non-tested operating systems.